I don't know if that of the title of my new post is really a dilemma for me though...A dilemma should be something that makes you spend some (a lot) of time thinking about it...I don't spend a lot of time thinking about twitter. And that is the problem! I know, I know...twitter is a must right now. If you don't have twitter you are out...blah...blah...blah...I know how the story goes. But, honestly, how do you guys keep up with everything? How do you guys have a daily job, a husband, a house to clean, a social life (if not often I still like to go out and see friends), facebook, the blog, all the networking sites, twitter....AND still manage to bake?! How do you guys do it? 'Cause if you have a secret, I really would like to hear all about it! I found this amazing recipe at Kayotic Kitchen. She has great step by step instructions and pictures on how to make it with the bread machine too, so I'll keep it brief. I did it by hand because I don't have a bread machine and because I really love making breads by hand...it's my stress release technique. Mix 2/3 of the butter with the milk. Lightly beat a large room-temperature egg. Put the milk and butter mix in the microwave for a minute at full power. It doesn’t have to be hot, just lukewarm. In a big bowl, sift 1 cup of flour and the yeast. Add 2 tbsp sugar, 1 tsp salt, and the egg. Mix until the flour is incorporated before adding another cup of flour. Repeat this process until all the flour is incorporated. As soon as the wet and dry ingredients are combined, start kneading straight away and only use extra flour if the dough starts sticking to your hands. Knead for about ten minutes, until you get a fluffy dough. Flatten it with your hand and using a sharp knife divide the dough into 9 pieces. Instead of rolling the dough in your hand, you simply fold the sides to the bottom and shape them in the palm of your hand. (This is a great tip that you should remember also for when you make pizza dough) Transfer them to the baking tray but give them a little room to rise. Cover them with a towel and let them rise for an hour to an hour and a half. Until they doubled in size. 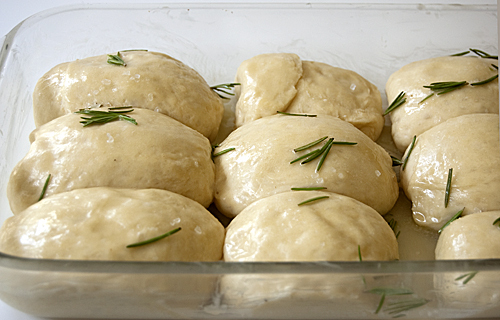 While the dough is rising, put a rosemary spring in a small bowl together with some garlic powder and the remaining 1/3 of the butter and lightly mix it. Leave it be for an hour or so, while the dough rises. Then put it in the microwave for 30 seconds at full power, or until the butter melts. Brush it all over the dough, spread some rosemary leaves and sprinkle some coarse sea salt all over the rolls. Bake them in a preheated oven at 350F for 20-25 minutes, or until all puffy and golden brown. I can almost smell them. I think these are calling to be amde this weekend. You are not alone. It is hard to keep up with all the social media. My mind is only starting to think in terms of status updates! The rosemary bread looks great! I can imagin myself dipping it in some olive oil and balsamic! I've just started to get the hang of Twitter myself, definitely very new to it still. It's very hard to balance everything, though, so I know what you mean. I know some things in my life have surely taken a back seat to blogging. 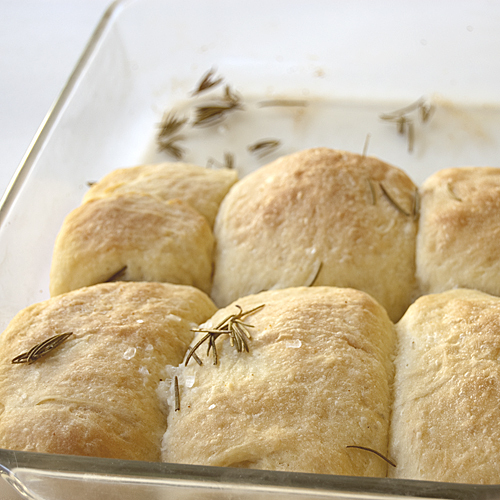 That said, your rosemary rolls look heavenly. 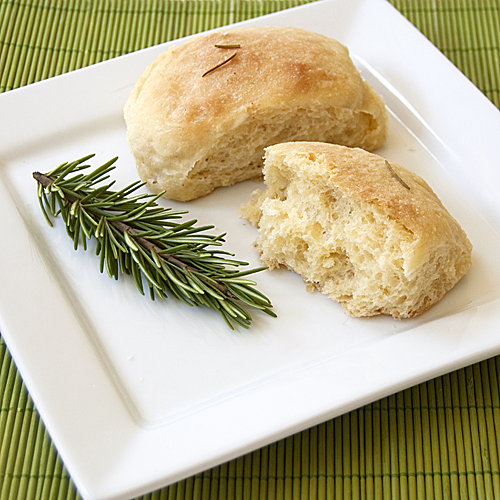 Rosemary is one of my favorite additions to bread. Yummy! I'm awful at remembering to update my Twitter. I get why I should use it, but it's hard to see the point sometimes. Hi Sara, I don't think I'll be jumping on the twitter bandwagon. I do have too many other things that I want to concentrate on, including kneading my own bread and spending time with my daughter and husband so if I lose a couple of people who might have otherwise seen my blog, so be it. I'll live and so will they. Hi again....just wanted to let you know that you're featured in my post for tonight. In any case, I agree! I still prefer spending my time baking and doing things with my husband than on twitter...so by now I signed up and I'm not really using it...maybe on day if my priorities change! I don't get Twitter - we have an account for our blog and my friend Stacie "manages" it :). These rolls look good! Please send us some! I have a weakness for breads. These rolls look wonderful. Wish I had a couple right now! I pick and choose my social media. I do facebook b/c I already was using it to alert my friends when I posted something new--so what's the difference if I create a specific fanpage? I got twitter solely for my blog. People use it at different levels, so it doesnt make me feel bad not to tweet every day. I mostly tweet when I have a new post (maybe once or twice a day) or when I have a question to pose to my followers or if I want to share something. So I say use what works for you and at the level that works for you. If it's better for you to bake so you have content, then that's what you should do. 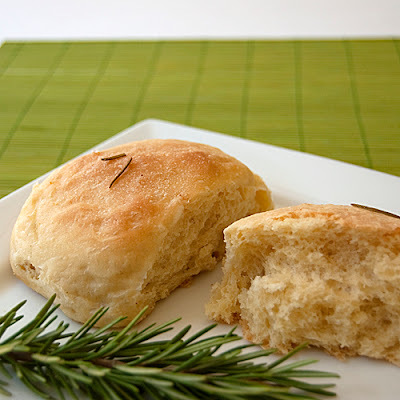 Speaking of which, these look awesome--I love rosemary & garlic together. I am with you as well about Twitter, I don't get it, I ask people questions as well and never get responses, maybe I am doing something wrong:) I am a sucker for bread and rolls and these look wonderful! I don't Twitter, or Tweet, or what have you, either. Maybe I will sometime but I can hardly keep up with my own life at the moment. The rolls look amazing. Great pictures! Now I am even more hungry! They look soooo good! Fantastic job. Thank you Cath! As good as easy to make. You should try them! These looks fantastic. I can imagine myself slather lots of butter when they are nice and warm. Yummy. I was determined to never join Twitter...but then I did..lol I synced my Facebook page with it and it updates my Twitter automatically. I still don't understand Twitter though. Love the rolls! I might have to try them this weekend!! Delicious combination.. like garlic bread on the hoof.. and how good is that! p.s: this recipe is so appetizing!! @Anna: you are so sweet...on this blog we LOVE mistakes :) that's why I have a habit of posting even the recipes that don't come out well. I constantly make a mess with my baking. But we learn through mistakes, right? I don't even count all the mistakes I make in English myself...people appreciate the effort. And if there is something you can't say...feel free to comment in Italian. i can smell that fresh baked smell right through the photos!